RVF2S Tasting Tables feature local fruits and vegetables in school cafeterias each month. February: winter squash! Humans have consumed squash for over 10,000 years. Squash are native to Central America, between Mexico and Guatemala. Originally, squashes were cultivated for the consumption of their seeds only, as they had minimal, bitter-tasting flesh; over time, fleshier, fruitier varieties were developed. In Aztec, Incan, Mayan and Native American cultures, squashes were grown in companionship with corn and beans. Store out of the sunlight, between 50-60 °F, with good ventilation. 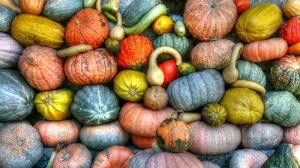 Depending on the variety, winter squash can be stored between 1-6 months. To ease prep, cook winter squash in its skin whenever possible. To make peeling easier, halve or quarter winter squash. Save the seeds—toss with olive oil and salt, then bake at 375 °F for 20 minutes.